My husband graduated from BYU last week! We are so excited. Now we are even more excited for Christmas to come. Can you believe it’s coming right up? Only a few more days. Since this is Derek’s last year working at his campus job, I wanted to make something nice for his co-workers Christmas present. I actually started thinking about it a few months ago because I was excited about it. I recently got the book Cake Pops. Have you heard of Bakerella? She is a cake pop queen and amazing at every sweet she makes. Anyway, she suggests before making cake pops to first make cake balls. So when I came across the recipe for Pumpkin Spice Cake Balls at Bake at 350 I decided it would be a perfect gift. I added cute Christmas sprinkles on top to make it extra Christmasy. Beat everything together (ending with the eggs) according to the package instructions and bake in a 13 X 9″ pan. Make sure the cake is completely baked (no gooey middle) before removing from the oven. Let cool completely on a wire rack. Crumble the cake apart in a bowl and add most of the can of cream cheese. Using your fingers, mix together until the cake holds together when formed into a ball. Add more frosting if necessary. Roll into balls of about a 2 bite size. This should make about 50. Place on cookie sheets lined with wax paper and refrigerate several hours. When ready to dip, melt the candy melts (I used two bags of melts total) a 1/2 bag at a time following the directions on the package. Roll with a spoon and place on another waxed paper lined sheet. Scatter on sprinkles if using while the chocolate is still wet. Store at room temperature. 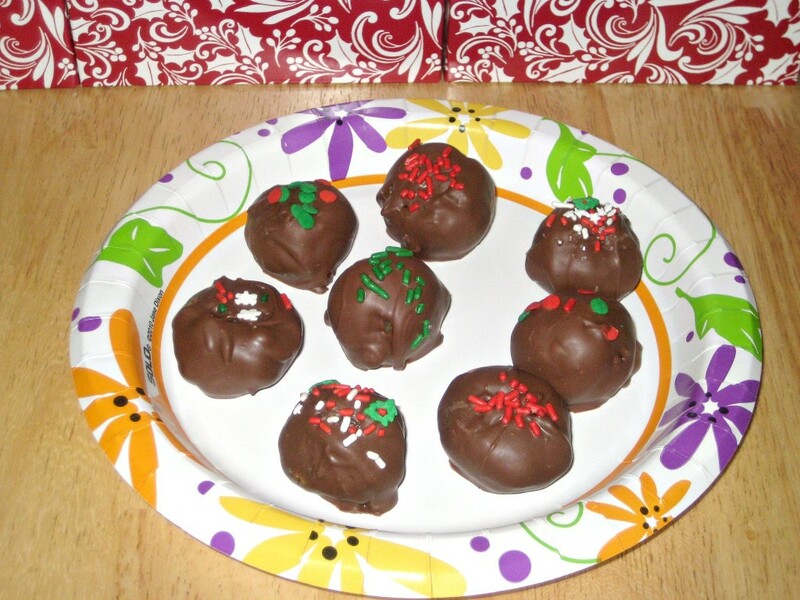 These cake balls look so perfect. You are not helping my sweet tooth…I’ve never made cake pops but the ones in that book look so adorable. I’ll have to try some after the first of the year.